Well, what do you know? The world's first pro quality, fully-integrated full HD 3D camcorder has a name -- and it's up for pre-order. The AG-3DA1 camera (available this fall) is equipped with dual lenses and two full 1920 x 1080 2.07 megapixel 3-MOS imagers for recording 1080/60i, 50i, 30p, 25p and 24p (native) and 720/60p and 50p in AVCHD. It can record for up to 180 minutes on dual 32GB SD cards in AVCHD PH mode, and sports dual HD-SDI out, HDMI (version 1.4), two XLR connectors, built-in stereo microphone and twin-lens camera remotes. This bad boy is listed at $21,000, and you can reserve yours for $1,000 down. That's nice of them, huh? But that ain't all! The newly announced AG-HMX100 video mixer (available this June) supports full 3D as well (we're sensing a theme here), as does the 25-inch BT-3DL2550 LCD monitor for field use (available this September). Just the thing for filming your Avatar fan films, huh? The latter two are priced at $5,600 and $9,900 respectively. PR after the break. "The AG-3DA1 will democratize 3D production by giving professional videographers a more affordable and simple solution for capturing immersive content as well as to provide a training tool for educators," said John Baisley, President, Panasonic Broadcast. "As the product is positioned in a more mainstream budget category, Panasonic camcorder owners will help to accelerate the amount of 3D content being created for distribution on new Blu-ray discs and recently announced 3D channels like those of Direct TV." Current 3D systems are large-scale setups in which two cameras are fitted to a rig in parallel, or vertically intersect across a half-mirror. Separate recorders are also required. In the AG-3DA1, the lenses, camera head, and a dual Memory Card recorder are integrated into a single, lightweight body. The camcorder also incorporates stereoscopic adjustment controls making it easier to use and operate. The twin-lens system adopted in the camcorder's optical section allows the convergence point*** to be adjusted. Functions for automatically correcting horizontal and vertical displacement are also provided. Conventional 3D camera systems require these adjustments to be made by means of a PC or an external video processor. This new camcorder, however, will automatically recalibrate without any need for external equipment, allowing immediate 3D image capture. The solid-state memory file-based recording system offers greater flexibility to produce Full HD 3D videos reliably in more challenging shooting environments. The AG-3DA1 is lighter weight and smaller than current 3D rigs, while providing the flexibility of handheld-style shooting. Setup and transportation is simplified, making it ideal for sports, documentary and filmmaking projects. Right and Left Full HD video streams of the twin-lens 3D camcorder can be recorded and distributed as files on SDHC/SD Memory Cards, ensuring higher reliability than tape, optical disc, HDD or other mechanical-based recording systems. This solid-state, no-moving-parts design will help significantly reduce maintenance costs. Users will enjoy a fast, highly-productive file-based workflow, with instant, random access to recorded content; easy plug-in to both Mac and PC-based platforms; and longer recording capacity. Using a standardized, fully integrated design, the AG-3DA1 is being offered at a much lower price than traditional 3D rigs. Transportation expenses for this handheld unit will be less and faster setup times reduce labor costs. Using standard, re-recordable SDHC/SD Memory Cards available already everywhere, media costs become almost insignificant. In addition to a camcorder, Panasonic also announced the BT-3DL2550, a 25" professional-quality 3D LCD monitor for field use, and the AG-HMX100, a professional HD digital AV mixer for live 3D event production. Panasonic will offer professional production equipment to allow video professionals to efficiently create 3D content, so consumers can enjoy 3D video using Panasonic 3D home theater systems. * As an integrated twin-lens Full HD 3D camcorder capable of recording Full HD 3D video to Memory Cards. As of January 2010 (based on our investigation). ** This pre-order program and contact information is limited to USA customers only. Customers outside of the USA can contact Panasonic in their region through the following website: http://pro-av.panasonic.net/en/3d. *** The point at which the left and right-camera lenses' optical axes converge. Movie companies and content producers are eager to produce more 3D content. 3D video is set to become a mainstream motion picture technology. In response to the resurgence of 3D movies, in September 2009, Panasonic proposed the world's first 3D home theater systems, based around 3D-enabled Blu-ray Disc players and Plasma TVs (announced and exhibited at CEATEC 2008). In February 2009, the company established the Advanced Authoring Center (within Panasonic Hollywood Laboratory) – at which 3D movies are authored for replication on 3D Blu-ray Discs (announced at CES 2009). Currently, producing 3D movies is a painstaking process. Panasonic intends to promote the production of high-quality 3D video content by accelerating the development of 3D video production systems designed to boost production speed and efficiency. SECAUCUS, NJ (February 12, 2010) – Panasonic now introduced the new AG-HMX100, a low-cost HD/SD digital A/V mixer that incorporates a built-in multi-viewer display output and combines high-quality video switching and audio mixing features. It offers a very flexible use interface and supports SD, HD, and 3D HD formats. Highly affordable, the new AG-HMX100 is ideal for use by schools, hotels, government facilities, corporations, public access channels, event producers, and in mobile or portable applications. The multi-format* HMX100 is an affordable, high-quality switcher/mixer designed to support multiple camera workflows, from production, to corporate A/V projects, to wedding and live events. This versatile production tool can even switch 3D HD video, making it the first affordable live switcher for use in 3D production. The HMX100 offers an array of interfaces including four HD/SD-HDI inputs/outputs, two HDMI inputs and two analog composite inputs, allowing the HMX100 to connect directly to virtually any camcorder or other video source. Additional connections include a DVI-I input for computer use, two DVI-D outputs (PGM and Multi-Viewer), a microphone input, dual aux in and audio outputs, a headphone jack, as well as connections for genlock, GPI, RS-232C and tally output. In addition to the ability to mix embedded audio from HD/SD-SDI camcorders and other and sources, the HMX100 offers eight XLR and two RCA connectors for line level audio inputs, as well as embedded audio output and two channels of analog audio out. The compact HMX100 features a 5.7-inch LCD display and an intuitive control panel that provides easy access to digital effects including basic pattern key, transition wipes, chroma and luminance keys, downstream keying (DSK), title key, time effects (still/strobe) and fades (in/out, video, audio). The unit also features preset/event memory buttons. For added flexibility, the mixer has a Multi-Viewer function that allows users to display video sources, audio levels, and a waveform monitor, in multiple windows on a single monitor. When connected to a single display, the mixer can display preview out, audio level meters, program out, input audio level meters (digital input only), six sources of video inputs, one source of DVI-I input and a waveform monitor. For use in A/V systems, the HMX100 connects easily with Panasonic projectors via DVI-D, HD-SDI and RS-232C connections to mix in various sources during a presentation, and can remotely control the projector's power and shutter settings. The HMX100 mixer will be available this June at a suggested list price of $5,800. 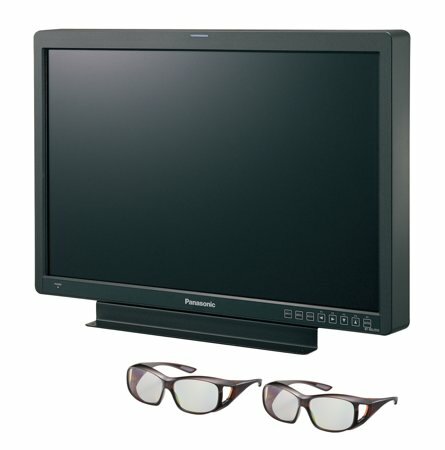 SECAUCUS, NJ (February 12, 2010) – In an expansion of its 3D production product offerings, Panasonic introduced the new BT-3DL2550, a 25.5-inch 3D LCD production monitor with full 1920 x 1200 resolution. The BT-3DL2550 provides 3D display with true-to-life color in a durable, production-tough LCD panel package. "With professional connectivity, including dual HD-SDI and DVI interfaces, exceptional color performance and a ruggedized frame, the BT-3DL2550 provides everything a production team would need for 3D monitoring in the field," said Joe Facchini, Vice President of Sales and Product Management. "It supports older frame compatible 3D formats and connects easily with common professional interfaces, so it can integrate into any production." The monitor displays 3D content using an Xpol®* polarizing filter, so content can be viewed with polarizing (passive) 3D eyeglasses. It switches from Left to Right image display, overlay, Left and Right two window display and 3D. BT-LH2550 LCD production monitor. With an In-Plane Switching (IPS) panel and 10-bit processing circuit, the monitor delivers full 1920 x 1200 resolution with exceptionally clear detail and offers six color settings - SMPTE, EBU, ITU-R BT.709, Adobe 2.2, Adobe 1.8 and D-Cinema – for superior color range and a three-dimensional look-up table (LUT) for calibration. It supports 1080i, 1080p and 720p playback, and offers pixel-to-pixel function in 720p mode. The BT-3DL2550 is equipped with two HD/SD-SDI inputs for simultaneous display of Left image, Right image and 3D signals. 3D signals can also be supported line-by-line or side-by-side using the monitor's DVI-D input. Additional professional level inputs include two HD/SD-SDI inputs, component and RGB, as well as standard RS-232C (9-pin) and GPI (9-pin) remote inputs, headphone jack, green and red tally lamps on the front panel. It also has an embedded audio decoder on board (through its headphone jack), time code display, closed caption (through video input only), audio level meter display of up to eight channels. The 3D monitor can be connected directly to Panasonic's Full HD 3D camcorder and other 3D cameras via HD-SDI inputs. It can also be connected to high-end NLE systems like Quantel's IQ and Pablo via its two HD-SDI (simultaneous signal) or to a NLE system running Final Cut Pro via DVI-D (line-by-line signal). Additional features include pre-installed calibration software, Cine-gamma Film-Rec compensation, Standard Markers and Blue-only, H/V delay display, monochrome and Cross Hatch overlay display, split-screen/freeze frame (live input vs. freeze frame), Five customizable function keys on the front panel can be assigned with various display modes and settings for quick, one-touch adjustments. The BT-3DL2550 has a durable, lightweight frame and aluminum alloy back panel, and it is VESA-mount compatible. It comes standard with two polarizing 3D glasses, a desk stand and an AC adapter. The BT-3DL2550 3D production monitor will be available this September at a suggested list price $9,900.